Campbell Scientific offers closed-path eddy-covariance systems for fluxes of CO2, H2O (latent heat), sensible heat, CH4, N2O, and CO2 isotopes. These systems are an optimum solution for long-term, low-maintenance flux monitoring thanks to the features of automatic zero/span, low-power requirements, and the revolutionary vortex intake (U.S. Pat. No. 9,217,692), which reduces maintenance and improves H2O frequency response compared to traditional closed-path systems. The systems are also designed to minimize spatial separation and better synchronize measurements, thereby reducing uncertainties in EC fluxes. Customization of systems to accommodate energy balance and other sensors may be possible; contact Campbell Scientific for more information. What is needed to set up a communication network for an eddy-covariance system in a remote location? What are the characteristics of the terrain? Which data logger will be used? Is there clear line of sight? Do cellular phones have coverage at the site? What are the distances between the base locations and the field locations? If there is a current network installed, what is it? Can wired networks be used? 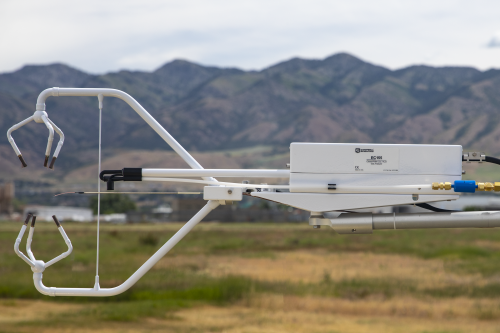 Eddy-covariance systems typically generate a multitude of data. Generally, not all of the data can be transmitted through a telemetry network. Experts at Campbell Scientific can help determine what data can be transmitted using telemetry. Where is there more information about open-path and closed-path gas analyzers?